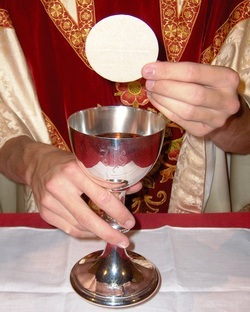 Also known as the Lord's Supper or Holy Communion, the Eucharist is the center of our common worship as the church. At the Eucharist, we as Christians encounter the Real Presence of Christ. During the Eucharist we remember the sacrifice that Christ made on our behalf, and glory in our union with him in his resurrection. We celebrate the Eucharist frequently, as we believe it to be the spiritual food we need to sustain us in our spiritual journeys and everyday life. At St. Andrew's, we celebrate the Eucharist each Sunday, and on many of the major feast days of the church year. Next, we listen to Scripture, typically hearing four different readings from the Bible. : a reading from the Old Testament, a Psalm, something from the Epistles in the New Testament, and a reading from the Gospels. The psalm is recited or sung by the congregation. The priest proclaims the Gospel reading in the midst of the congregation, as a sign that Christ the Word is present in the midst of the church. At the end of the Eucharist, the congregation prays once more in thanksgiving, and then is dismissed to go forth into the world to the life of service God. has called each of us to take up. "Go in peace, to love and serve the Lord!"